When people refer to Bangalore, they immediately visualise the chaotic traffic scenario. A lot of concern has been expressed over the years on the congestion issue with government launching several schemes to improve its traffic (Building several Roads, Flyovers etc) but alas no solution!! Bangalore has approximately 6.8 million trips daily. Urban sprawl in years has increased the trip lengths, which has resulted in decreasing mode share of public transportation and increase in private automobiles. The problem is not insufficient roads as made out by the authorities but the priority given to improve vehicular flow rather than improving people movements. The transportation share is nearly 20% of the Bangalore's landuse which simulates international practice. Than why so much congestion? As per my estimate Bangalore loses out nearly 208 million Rs per day due to congestion (A very Conservative Estimate). The root cause for congestion can be known from the fact that the 88% of total vehicles constitute only two wheelers and four wheelers, which contribute only 39% of total Trips. It is very surprising to know that nearly 25% of trips are made in range of 1-5 km. Nearly 40% of those trips are made by motorised share (Cars/Bikes). We need to eliminate those trips by using non motorised transportation such as by walking, cycling etc. Bangalore lacks good pedestrian facilities. Pedestrians have to compete with vehicles, hawkers and encroachment to gain space. It is fact that nearly 40% of people killed in accidents in Bangalore are pedestrians. Improving footpaths are very economical way of sustainable transportation, which we often neglect. The pedestrian crossings are very rare to find in Bangalore roads. In fact you may find more number of flyovers in Bangalore than grade separated pedestrian facilities. Authorities need to improve footpaths/ provide pedestrian facilities at war footing. Cycling as a mode of transport is virtually non-existent in Bangalore (less than 2%). Bangalore has nearly 477853 cycles. Such a large number of cycles does not transform into trips on roads basically due to lack of facilities (less than 15% operational trips). If proper facilities such as cycle tracks are provided by the authorities than the mode share has the potential to improve in Bangalore. It can also be developed as a feeder to public transportation by providing small parking facilities near prominent bus stops. Internationally the City-Bike System is the new big thing. It involves provision of city bikes with proper infrastructure (monthly-annually-fees) with several parking lots provided by the private party. It is considered to be the best option to demotorise thus having a sustainable city. Awesome summary of stats sudhir. I have posted tables of relevant stats from the CTTP as an attached page. 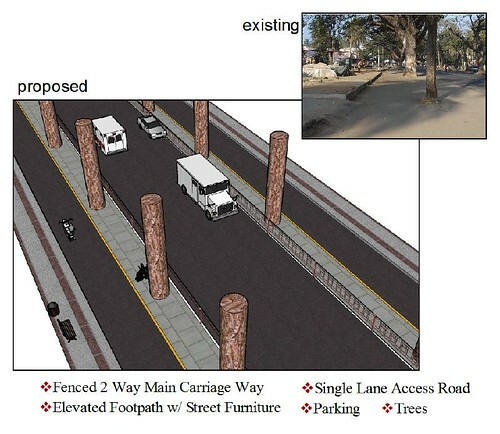 I have also added a relevant article by Kathyayini Chamaraj, in the Deccan Herald, that connects trees, pedestrians and cyclists, with Hasiru Usiru, Bangalore's Tree Authority, BMLTA and the CTTP and the National Urban Transport Policy and makes a case for co-opting the trees in development. Great write-up, Sudhir: How about publishing this in the National Dailies with a byline mentioning Praja? Also, submit copies to the authorities concerned? sudhir, thanks for making a case for ped and NM users on its own merit and not making it a this vs that argument. everybody in the city is a pedestrian at some point of the day or the other. this is something that Arun & I made for New Kantaraja Urs Road in Mysore. a general comment on the subject, basically motivated by the following points in KC's article... "HU has questioned whether road-widening is necessary at all since the proposed Metro will be passing through many of these areas and the quantum of vehicular traffic is expected to reduce on these roads." "Widening roads has never provided the solution for congestion anywhere in the world." While we cannot imagine cities like Mumbai and NYC without their public transit, has public transit provided a solution to congestion anywhere? No. congestion cannot be eliminated. it can only be managed. it will take all sorts of solutions to manage it. roads, trains, zoning ... i wonder why we always look at it from this or that proposition. it will take this and that and then some more. at 65 lakhs and growing, bangalore has crossed the threshold and entered the league of big cities. we neglect its arterial road network and mock its efforts to build one, at our own peril. all this will take lots and lots and lots of money. good, livable cities donot come by cheap.